Delaware illustrator, Pat Higgins will be contributing two new paintings to the 2012 Coffin Ball Art Show. 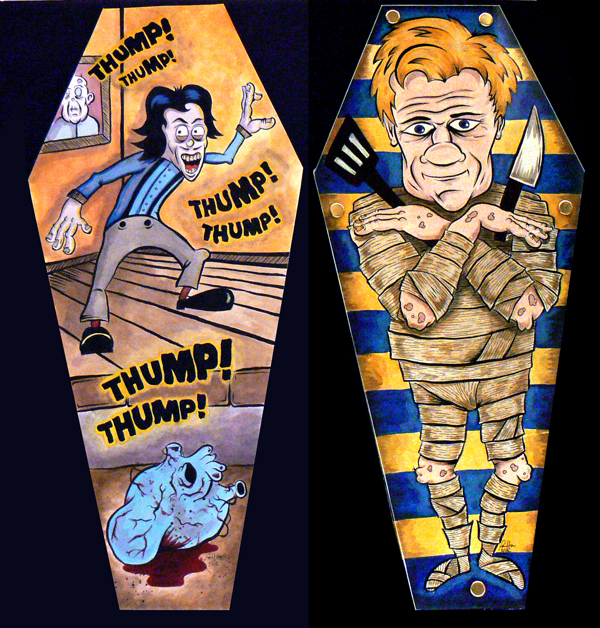 The first painting, “The Tell-Tale Coffin” is based on his recent adaptation of Edgar Alan Poe’s “The Tell-Tale Heart”. The other new painting, “Chef Ramses The Great”, is a mash-up of celebrity chef Gordon Ramsay and Egyptian pharaoh, Ramses the Great. Other artists participating in the event include: Ric Frane, Eric Hendrickson, Pat McCutcheon, Tina Marabito, Dave Mele, Jeff Madonna, Wendy M., Professor Ouch, Mark Rosenblatt, Matt Stankis, and more tba. The Coffin Ball will be held Friday, October 5th, 2012 at the Talleyville Frame Shoppe in Wilmington, Delaware and the art will be hanging in the shop for the remainder of October.